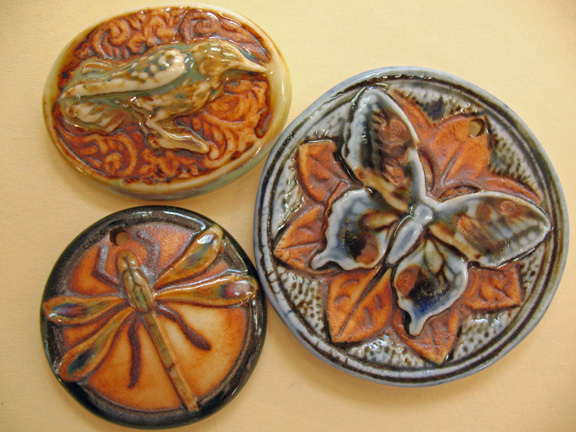 Bead Bazaar is excited to feature one of our favorite ceramic artists as October’s Artist of the month. Jean Christen, the Clay Genie, is a talented Washington State studio potter whose distinctive beads have entranced us, and we’ll be offering an extended collection of the Clay Genie’s beads until the end of October. While we’ve introduced you to her work before, we wanted to share some of her story. Jean started as an apprentice for a potter on Vashon Island at the age of 18, and has been a potter for over 40 years now. Being a studio potter is more of a lifestyle than a job for her. She works with great dedication for long hours- sometimes staying awake and working for 24 hours at a time- and is rewarded with beautiful results. She credits her success to her unique style and devoted work ethic. During her apprenticeship, Jean’s love of beads led her to try something new; the type of firing she does is a studio pottery technique, and applying that technique to beads is a trait unique to Jean’s work. Throughout her career Jean had the opportunity to do a lot of traveling and worked in many studios around the country. 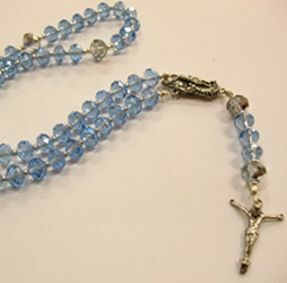 During this time she was able to sell her beads and found that her work and aesthetic always had an appeal, partially because of how unique it was. This success has kept her going and allowed her to dedicate her time to her pottery. As a studio potter with a penchant for making beautiful beads and pendants Jean employs her own reduction glaze mix. A technique developed in China, reduction glazes force the oxygen out of the clay itself, producing the glittery effect of the glaze. Colors are not always predictable, as temperature variations can produce dramatically different and unique effects. Liquefied glazes running and blending with each other can also created one-of-a-kind color combinations. Jean goes through spurts of focusing on making pots or beads and is always experimenting with new glazes or design ideas. After 40 years, she finds making her pieces to be fun and meditative. She never stops learning or finding new ideas. Jean finds the medium itself to be very inspiring and whether she’s making a bead or a pot, she tries to put as much beauty, color, and symbolism as she can into the piece. Inspired by ethnic folk art, she finds beauty in the imperfect details with its sense of organic beauty rather than machined precision. She is also inspired by the details of traditional Tibetan, Islamic, and Persian art. Jean’s highly detailed and refined aesthetic reflects these inspirations; all of her pieces are unique and organic with incredible detail. As an artist Jean loves knowing that people treasure her pieces and hopes their beauty continues to give them pleasure, whether it a piece worn around their neck or displayed in their home. Considering her passion for clay it’s not surprising that Jean’s other passion- gardening is also tied to the earth. She started gardening when her three sons were born and loves it, finding similarities between working a lump of clay and planting a seed. For each there’s a process and an end result coming from the minerals of the earth. Jean fondly jokes about getting her hands out of the wet clay and glazes and putting them into the compost, keeping her hands in the earth in one way or the other. She also stays busy spending time with her 10 grandchildren and teaching classes at the Orient School. After offering classes for 102 years, the Orient School is the oldest school in the state of Washington! Since being a studio potter is more a life style than a job, it isn’t really something one retires from, and Jean intends to continue on as an artist well into an advance age. She admiringly mentioned a woman who lived and worked as a studio potter until the age of 103! While the work is physically demanding, Jean looks at it optimistically: it keeps her physically active, and as a potter gets older they just need to pace themselves more. We look forward to seeing Jean’s continued work and experimentation, and are just thrilled by what has been achieved by such a talented Washington State artist. Bead Bazaar is proud to announce our participation in Fairhaven’s 7th annual Girls’ Night Out fundraiser on Friday, May 11th. We’ll be open and stamping passports from 4:00pm-8:00pm. Make sure to drop off a raffle ticket for our fabulous door prize! This year we’re giving away a necklace and earrings fit for a night on the town. 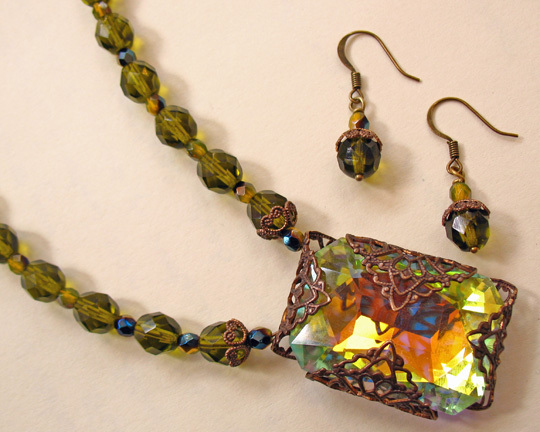 Vintaj filigree is wrapped around a stunning focal crystal and accompanied by rich olive beads . Treat yourself to the chance of winning this fabulous set, valued at $50! In the spirit of Girls’ Night Out, Bead Bazaar is inviting you to think pink. For one day only, all loose beads in shades of pink will be 25% off. Sale items include Swarovski crystals, rose quartz, pearls, and more! Don’t miss our entry in this year’s fashion show! Bead Bazaar employee Jessica will be strutting her stuff down the runway in a hand-made chain dress. Make sure to catch this dramatic piece! The fashion show will be held at the Ferry Terminal at 9pm. Want more info about Girls’ Night Out? Visit their webpage and show them some love! We’ll be seeing you Friday night! Who can say no to such heat-warmingly cute projects? Details about cost, registration, and required supplies can be found on our website at our Workshops page. Feel free to come by or call with any questions, and be on the look-out for more workshops in the future! Happy Beading! Welcome to our Beading Brunch! 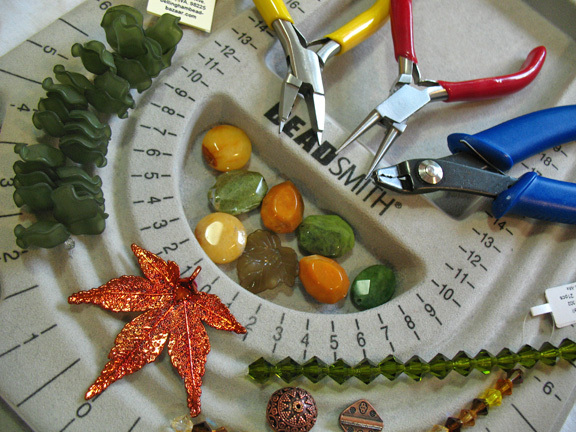 In the spirit of community crafting, the Bellingham Bead Bazaar is going to start hosting Beading Brunches! 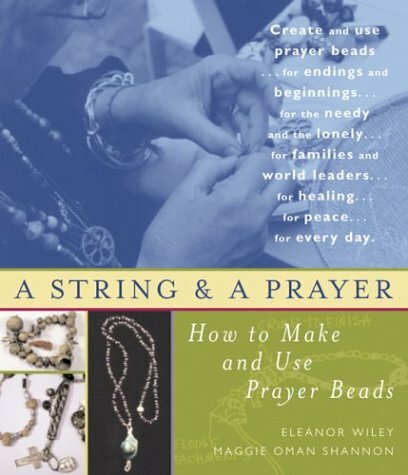 Held on the first Sunday of each month, beaders are welcome to bring any current beading projects (or begin new ones) and use our work space to socialize with others. 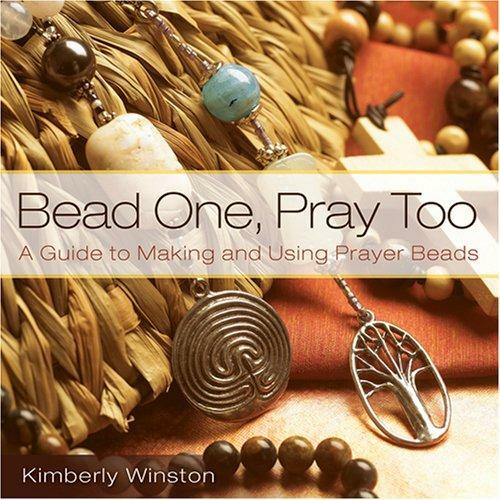 Beaders are welcome to share wisdom and creative ideas, and if there’s any tools you’d love to try, feel free to ask! 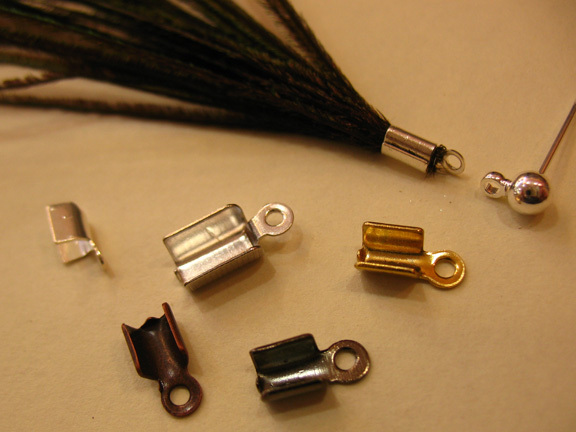 We have bailing pliers, a metal holepunch, and hammers and anvils at your disposal, as well as many others. This is the perfect opportunity to share hints and tips with fellow beaders and compare projects! Invite your friends or come to make new ones at our first meeting, Sunday October 1st, from 10:00am-12:00pm. You provide the creativity, and Bead Bazaar will be providing coffee and pastries. To allow us to prepare, please RSVP no later than the day before each brunch at 360-671-5655. Cost is $5 to cover the refreshments.